Beautiful 4 bedroom semi-detached house within walking distance of the charming village of Mountbellew and local Golf Course and Mountbellew Demesne Forest Park. LOCATION: The property is located in a small residential development within walking distance of Mountbellew village. 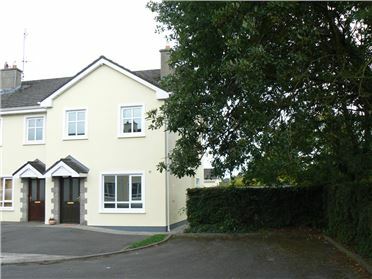 The property avails of all local amenities in Mountbellew village together with the attractive Mountbellew Demesne with its nature trails and walks beside the well-known Mountbellew Golf Course, an excellent array of schools both national and secondary are available locally. Mountbellew village is highly regarded as a well-established and sought after residential location with many natural amenities at its doorstep to include Mountbellew woods and trails, Mountbellew 18 hole Golf Course, beautiful picturesque village of Mountbellew with its large Square and local community facilities together with shops, pubs amongst others. Mountbellew Agricultural College is a known local landmark. Mountbellew town is within easy access of Galway city which is approximately 28 miles and with newly opened M17 / M18 outside Abbeyknockmoy Village offering excellent connectivity. 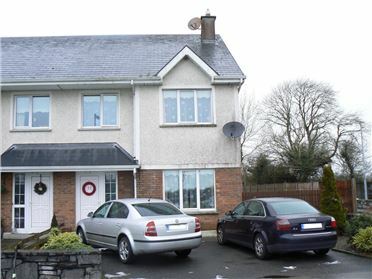 Beautiful 4 bedroom semi-detached house on corner site overlooking large green area and within walking distance of the charming village of Mountbellew and local Golf Course and Mountbellew Demesne Forest Park. 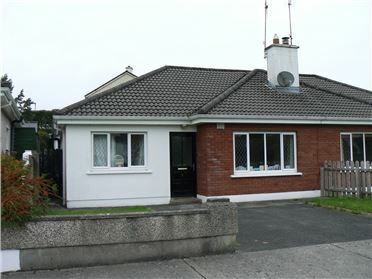 LOCATION: The property is located in a small residential development within walking distance of Mountbellew village. 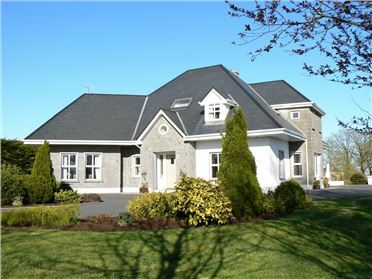 The property avails of all local amenities in Mountbellew village together with the attractive Mountbellew Demesne with its nature trails and walks beside the well-known Mountbellew Golf Course, an excellent array of schools both national and secondary are available locally. Mountbellew village is highly regarded as a well-established and sought after residential location with many natural beauties at its doorstep to include Mountbellew woods and trails, Mountbellew 18 hole Golf Course, beautiful picturesque village of Mountbellew with its large square and local community facilities together with shops, pubs amongst others. Mountbellew Agricultural College is a known local landmark. Mountbellew town is within easy access of Galway city which is approximately 28 miles and with newly opened M17 / M18 outside Abbeyknockmoy Village offering excellent connectivity. DESCRIPTION: The property comprises a very well maintained and spacious 4 bedroom semi-detached residence in a well maintained and quiet residential estate on the edge of Mountbellew Village. The property has an attractive low maintenance pebble dash and part red brick façade and is situated on a spacious corner site with a spacious side garden and large rear garden. The property extends to approximately 1,230 sq.ft. The property is in very good order and is in ready to walk in to condition. Heating is by means of oil fired central heating and open fireplace to sitting room. The windows are of PVC double glazed construction. The house is a spacious family home with a large sitting room with French doors leading to a spacious kitchen / dining area and with patio doors out to rear large enclosed garden. To the rear there is a utility and downstairs toilet. Upstairs there are four fine bedrooms, all with timber floors and the master bedroom being en-suite. The main bathroom comprises a matching bathroom suite with partly tiled walls and timber floors. This property is a very attractive well located property situated in an attractive position in the estate overlooking a large green area and on a corner site. The property also has a very spacious rear garden with two timber garden sheds and wide side garden. To the front there is a front tarmac driveway suitable for two car spaces. ELEGANT FAMILY HOME OF TREMENDOUS APPEAL IN SUPERB CONDITION THROUGHOUT NESTLING ON A LOVELY SITE AT THE FRONT OF THE STABLES DEVELOPMENT WITHIN WALKING DISTANCE OF THE PICTURESQUE VILLAGE OF MONIVEA FORMER SHOWHOUSE IN PRISTINE ORDER LOCATION: The property is located on a fantastic site within walking distance of Monivea village with Monivea woods in the background and adjacent to local walkways through Monivea Woods in a serene country village setting. Monivea is located approx. 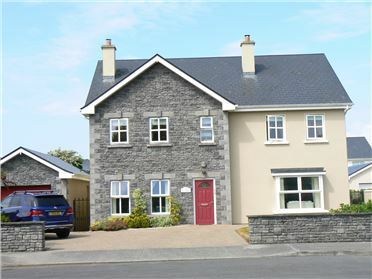 5.5 miles from Athenry town and approximately 15 miles from Galway city and is a picturesque and very popular village with its unique wide open greens and steeped in strong local history. The Stables is located on a beautiful site with stone wall front boundary and is just a leisurely stroll to the village. All in all an excellent residential location with all the local residential amenities to hand to include local National School, Shops, Church, Pubs, Garda barracks , Post Office , childrens playground and a wide range of local community facilities and entertainment facilities. Galway city is within an easy commute. DESCRIPTION: The property comprises a beautifully presented two storey detached family residence with the additional benefit of a complete attic conversion offering exceptional accommodation throughout. The house is constructed and is finished to a showhouse condition being used for holiday home purposes. Viewing of this property is highly recommended and comes to the market in turnkey ready to walk into condition both outside and inside and boasts an overall internal area of approximately 2,150 sq ft together with an additional attic conversion area of 410 sq ft giving an overall area of 2,560 sq ft. Outside ,the property has tremendous kerb appeal with an elegant two storey façade with an attractive bay window to the living room and fine spacious paved front forecourt welcomes you into the property. There is a side detached garage together with front and rear enclosed lawned gardens. The property is situated to the front of The Stables development on the edge of Monivea village and is set back from the main road with ample car parking provision to the front. The property has a vast array of fantastic features and finishes to include excellent quality carpets, curtains and tiling, superb reception and living room areas, splendid kitchen / dining / living area spanning one side of the ground floor with patio doors leading to the side, superb fully fitted kitchen and utility areas, downstairs bedroom with en-suite provision (also connected to utility area), 3 fine bedrooms at first floor area with one of those bedrooms laid out originally as two bedrooms and currently used as a large master en-suite bedroom with walk in wardrobe and stylishly laid out en-suite. The attic area is fully developed with a natural stairs leading to same and this area comprises two fine rooms and a landing area with excellent natural lighting, flooring and high level of finish throughout. The property is being sold with excellent quality carpets, curtains, blinds and fixtures and fittings. BEAUTIFULLY PRESENTED 3 BEDROOM END OF TERRACE HOUSE WITH SPACIOUS GARDEN WITHIN WALKING DISTANCE OF ATHENRY TOWN CENTRE AND TRAIN STATION. Beautifully presented 3 bedroom end of terrace house with spacious garden in beautiful modern development within walking distance of Athenry Town Centre & train station. With Galway now only a few minutes from Athenry along the new Motorway and enhanced railway service, it makes Athenry a top class residential destination. DESCRIPTION: The property has benefitted recently from a total redecoration to include painting, new carpets, new semi solid antique oak floors to sitting room, new shower to en-suite, external painting, etc. 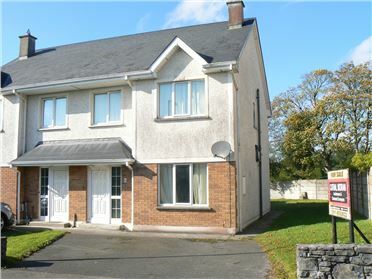 The house is in ready to walk into condition and offers to the market a lovely bright and well laid out 3 bedroom end of terrace property in a highly convenient location in Athenry town within walking distance of all local necessary residential amenities. The house has pvc double glazed windows and oil fired central heating. Total gross internal floor area -approx. 992 sq ft.
EXCELLENTLY PRESENTED AND VERY ATTRACTIVE 2 BEDROOM SEMI DETACHED BUNGALOW RESIDENCE IN THIS HIGHLY SOUGHT AFTER AND TOWN CENTRE ESTATE OVERLOOKING GREEN AREA JUST AROUND THE CORNER FROM ATHENRY TRAIN STATION AND AN ARRAY OF SCHOOLS TOGETHER WITH BEING A SHORT STROLL FROM ALL THE RESIDENTIAL AMENITIES AND FACILITIES AVAILABLE IN THIS MEDIEVAL AND HERITAGE TOWN LOCATION: The property basically comprises a single storey semi-detached residence in a small housing development enclave on the Athenry / Tuam Road within walking distance of Athenry Town Centre. Lambert Court is situated close to Athenry Railway Station, Town Centre and the local Secondary and National Schools in the immediate vicinity. The property enjoys a very accessible and convenient location being within easy walking distance of all local necessary residential amenities in the Heritage and Market Town of Athenry. DESCRIPTION: The property basically comprises a 2 bedroom semi-detached residence built approximately 20 years and in good condition throughout. The property is constructed of concrete block wall construction and has a pitched slate roof over same. There is a part red brick façade to the front of the property. Outside, there are front and rear gardens which are well maintained.In addition there is a single storey shed to the rear of the house. The property has pvc double glazed windows and oil fired central heating. Elegant and stylishly designed contemporary 4 bed detached dormer style residence in pristine order on beautiful landscaped site. Excellent opportunity to acquire a beautifully presented spacious modern residence extending to circa 2,855 sq.ft on lush landscaped site of c. 0.56 acre. LOCATION: The property is located in a beautiful tranquil residential location just a few minutes drive to the ever picturesque village of Monivea and with Galway City approximately 18 miles. The property is located on the Monivea / Abbeyknockmoy road midway between the two villages and also avails of excellent new Motorway service at nearby Annagh Hill just outside Abbeyknockmoy, on to the M17 / M18 which further links with the Galway - Dublin route outside Athenry. All residential amenities are available locally in the popular villages of Monivea and Abbeyknockmoy with excellent residential amenities including Schools, shops, Church, Community and leisure facilities and a wide range of sporting activities in the locality. This beautiful family home represents superb value for money given the quality of finish, spacious layout and accommodation, scale and design, and the fantastic country location in this very convenient and sought after residential area. Monivea village is only approximately 2.5 miles. DESCRIPTION: The property is a truly tremendous stylishly laid out family residence of character with an attractive unique dormer style design set on a fabulous landscaped site and presented in superb order throughout. The property was built in 2001 and extends to approximately 2,855 sq.ft together with double lofted garage and nestling on beautiful landscaped gardens and with tarmac driveway and forecourt. A unique feature of the property is the large main living room off the front entrance hallway and featuring a 17ft ceiling height with exposed timber beams, gallery from first floor, and beautiful rustic maple timber floors with feature fireplace. A well laid out kitchen / dining area opens in to a family living area being an ideal living hub of the house and with patio doors to the side. The property boasts three en-suite bedrooms (one en-suite not finished), spacious downstairs toilet, and main bathroom upstairs. All in all this is a wonderful family home of generous proportion and stylish design and layout and in ready to walk in to condition. The property is of concrete block wall construction with pitched slate roof and the windows are PVC double glazed. The central heating is gas fired together with solid fuel stove to main kitchen area and fireplace to living room. This elegant and beautifully laid out family home comes to the market in pristine order and nestling on a fantastic manicured site offering the best of country living from this very convenient and well located residential area.